With the current war-mongering rhetoric between U.S. President, Donald Trump, and the leader of the North Korean regime, Kim Jon Um, it is well to reflect on a report that appeared in the Irish Independent on August 9th, 1945. This followed the dropping of an atomic bomb by the U.S. Air Force on the Japanese city of Hiroshima at 8 am on August 6th, 1945. "All living things, human and animal, were literally seared to death...the dead are simply uncountable". In these graphic words Tokyo reports told for the first time of the cataclysmic damage caused by the atomic bomb dropped on Hiroshima. 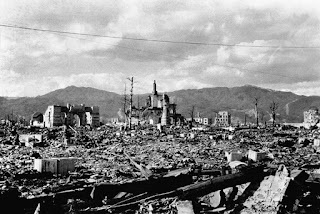 The major part of Hiroshima was destroyed. "The destructive force of the new weapon is indescribable, as is the terrible devastation it has caused" said the report. The bomb was described as more powerful than 20,000 tons of TNT and with more than 2,000 times the blast force of the British ten-ton bomb, hitherto the largest bomb used in warfare. Bombs many times more powerful are available in the arsenal of the U.S. at the present time. Another atomic bomb was dropped by U.S. on the Japanese seaport of Nagasaki on August 9th, 1945.